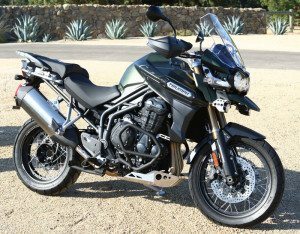 When Triumph introduced its Tiger 800 and 800XC for 2011 and Tiger Explorer for 2012, the British manufacturer clearly wanted a slice of the rapidly growing adventure-touring market, with its sights set primarily on BMW’s popular GS line. 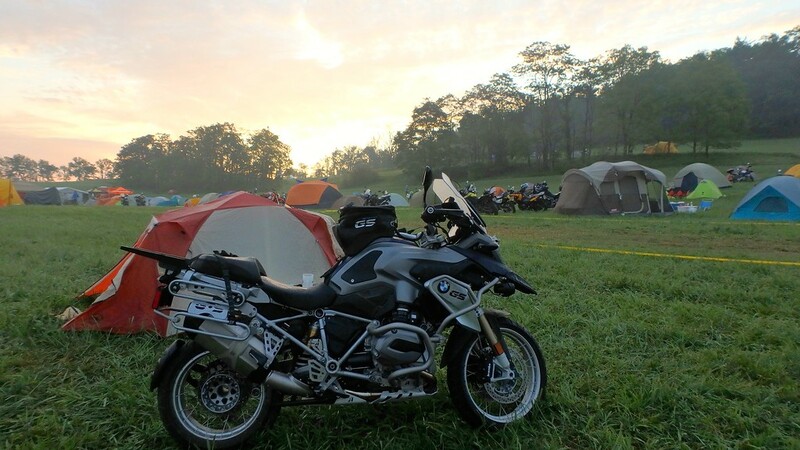 The Tiger 800/XC compete head-to-head with the BMW F 650 GS and F 800 GS, respectively, and the Tiger Explorer competes with the BMW R 1200 GS, as well as other big-bore adventure bikes such as the Ducati Multistrada 1200, KTM 990/1190 Adventure and Yamaha Super Ténéré. Tubular-steel engine guards and an aluminum skid plate are among the XC’s upgrades over the standard Tiger Explorer. 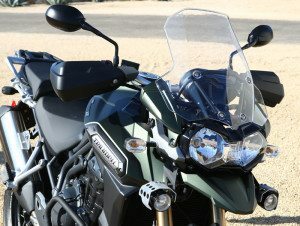 The XC designation on the Tiger 800XC refers to “cross country,” and it departs from its standard-model sibling with beefier, longer-travel suspension, a larger-diameter front wheel (21 vs. 19 inches), spoked instead of cast wheels, more dirt-oriented tires and guards to protect the radiator and handgrips. When the Tiger Explorer was first released last year, an XC model wasn’t in the picture. 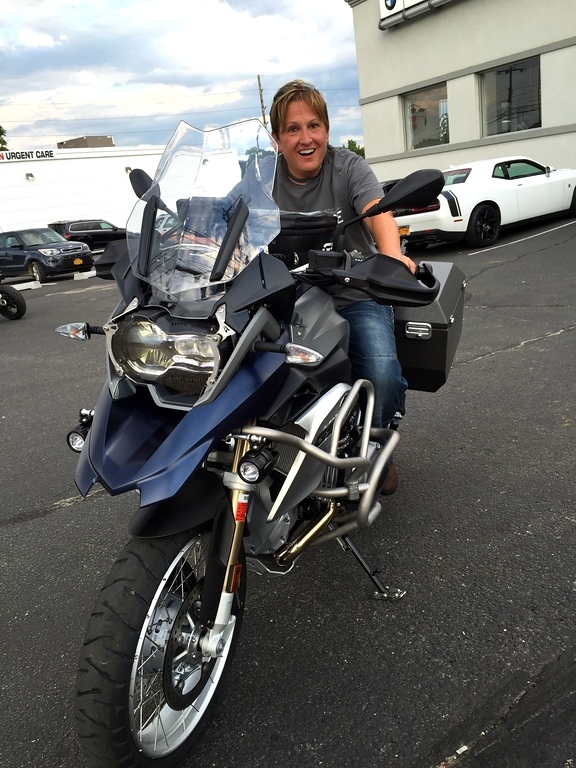 But given the popularity of rugged accessorized models such as BMW’s R 1200 GS Adventure, it was only a matter of time, with Triumph introducing the Explorer XC just a year later. 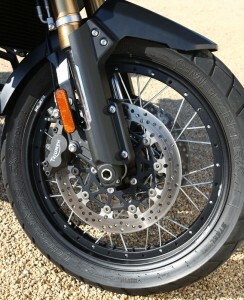 Instead of the base model’s cast wheels, the Tiger Explorer XC has Saxess-made aluminum wheels laced with steel spokes that run tubeless tires, similar to the setup found on the Yamaha Super Ténéré. Wheels on both the base and XC models are shod with Metzeler Tourance EXP tires, which are designed for 95-/5-percent on-/off-road use. To protect the XC from damage, it has plastic hand guards, engine guards made of 22mm-diameter steel tubing and a skid plate made of 3mm-thick aluminum. Fog lights with 55-watt halogen bulbs and aluminum protective cages boost illumination, and the bodywork is painted a special matte Khaki Green. At $17,199, the XC costs $1,500 more than the standard Tiger Explorer. 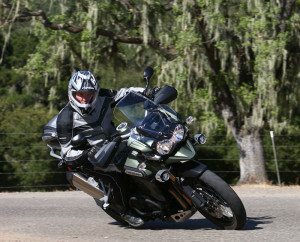 Most of the accessories can be purchased from Triumph’s P&A catalog for a few pennies below $910, so in effect you get the stylin’ mil-spec paint job and trick Saxess wheels for just $590—a sweet deal. Saxess-made aluminum wheels have steel spokes laced through a center ridge that allows use of tubeless tires. Although better protected from abuse, the Explorer XC is hardly more dirt-oriented than the standard model. It doesn’t have more suspension travel or a larger front wheel, and it remains a heavy (601 pounds fully fueled—16 pounds more than the standard model) adventure tourer that’s best suited for pavement or the occasional smooth gravel road. On the street, it excels. 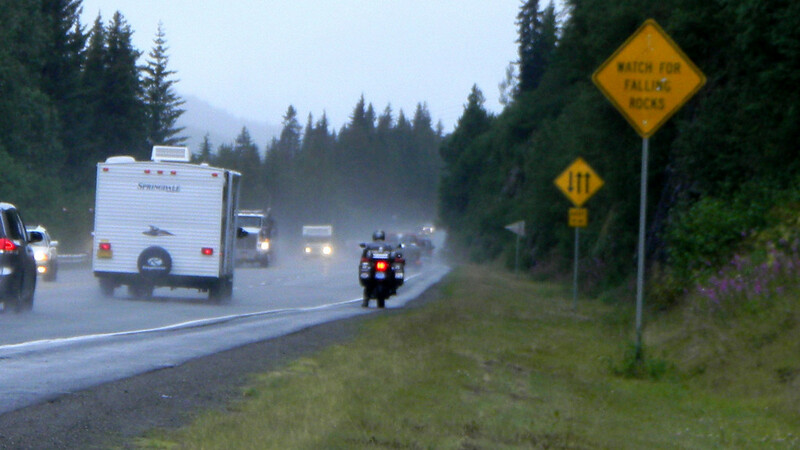 The Explorer’s liquid-cooled, 1,215cc in-line triple cranked out 118.5 horsepower and 78.5 lb-ft of torque on the dyno during our 2012 test, and its broad spread of torque provides brisk acceleration whenever you need it. 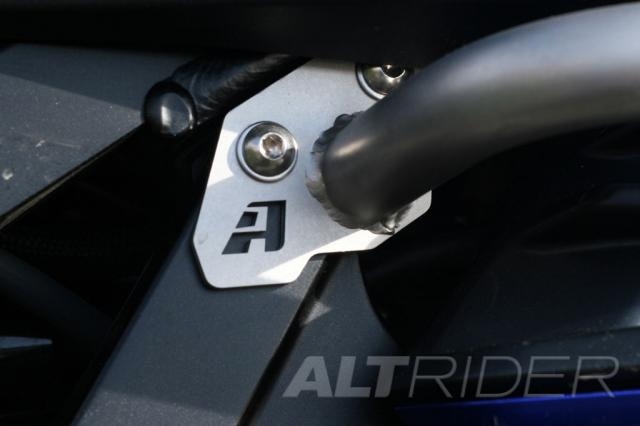 The throttle-by-wire is a tad sensitive and vague, but a little adaptation makes the bike easy to live with. 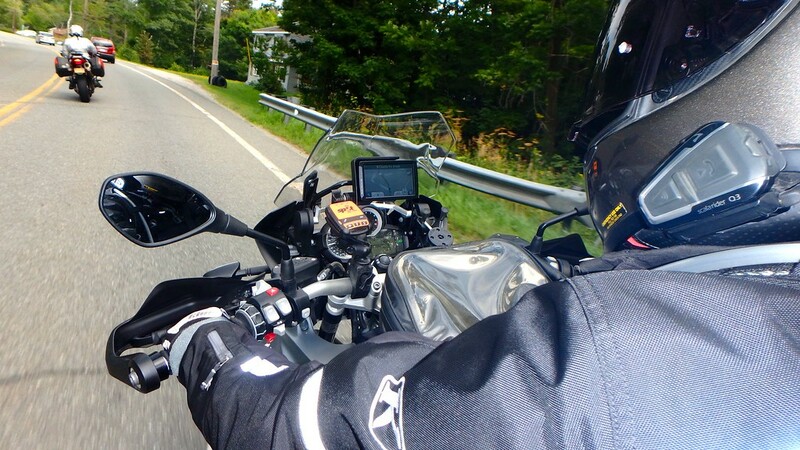 With standard amenities like ABS and traction control (both of which can be turned off), cruise control, adjustable ergonomics, high-quality suspension and brakes, and 950-watt charging output, the Tiger Explorer is a great touring bike. 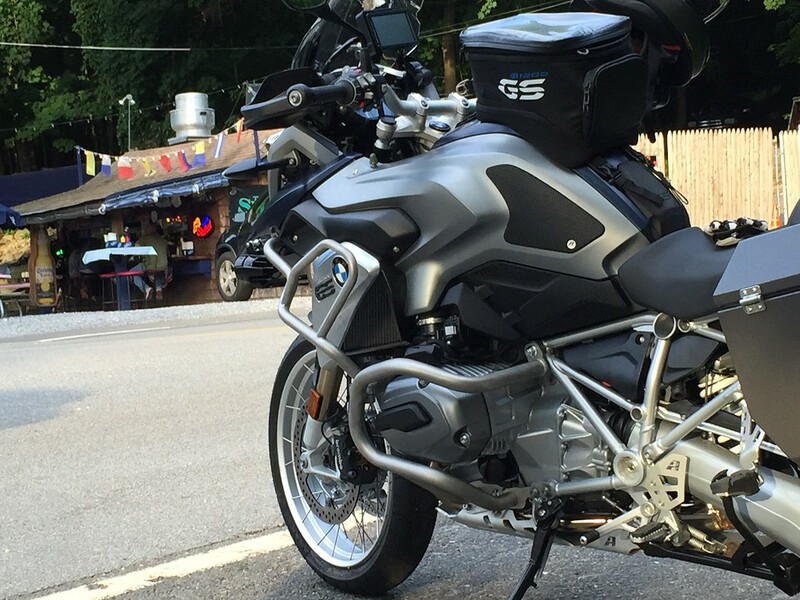 Think of it as a tall sport tourer, ready to shred the pavement with every twist of its tail. And in XC guise, it has many of the look-the-part accessories adventure riders want along with a really cool paint job. The Tiger Explorer XC looks sharp in its unique matte Khaki Green livery. 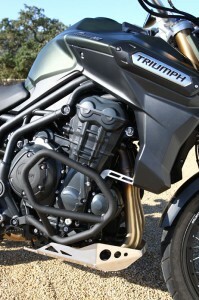 Engine Type: Liquid-cooled, transverse in-line triple, DOHC, 4 valves per cyl. Hand guards and halogen fog lights are standard on the Tiger Explorer XC. 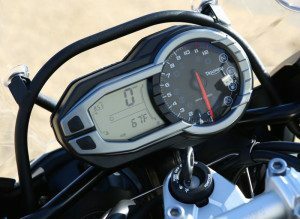 The Tiger Explorer XC has the same dash as the standard model, with an analog tach paired with a multifunction LCD display. Smooth gravel roads are about the extent of off-road-worthiness of the Tiger Explorer XC. 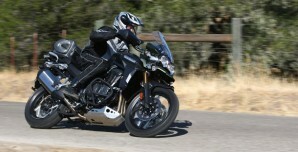 Where the Tiger Explorer XC really shines is on curvy back roads, where its potent in-line triple rips out of corners. I really want to like this bike, and it looks quite nice, but there’s nothing particularly remarkable about it… it’s rather porky on the scales (30kg MORE than the R1200GS which is hardly a lightweight! ), the instrument panel looks circa 2002 in design, and the switches are a mismatched mess of shiny black plastic… These details are such a shame since that 3 cylinder engine is a cracker. But when the competition in this class of bike (BMW R1200GS, KTM1190, Ducati Multistrada) is offering full LED lighting all round including aux/fog lamps and all manner of electronics (driving modes etc) to make the ride smooth and safe, it seems Triumph need to step it up a bit since its competitors also offer a characterful selection of powerful engines. 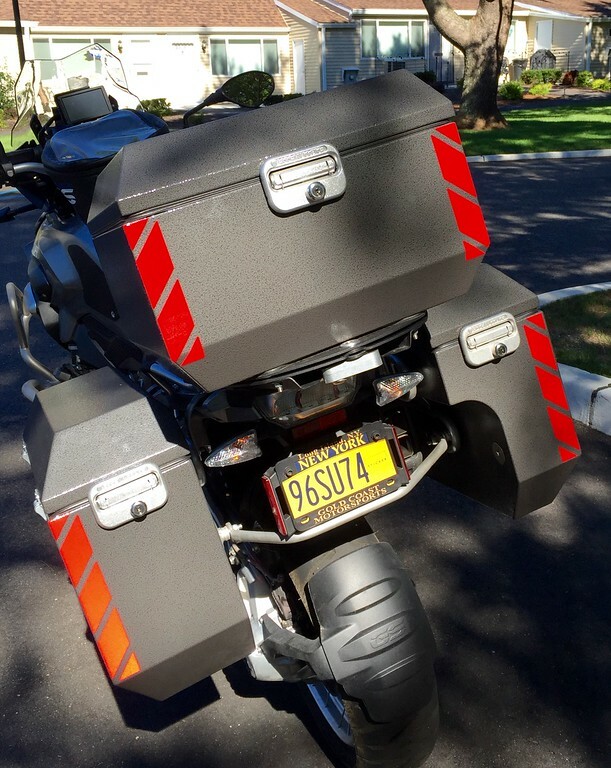 This bike is really an over sized Tiger 800. It even sounds like the Tiger. The instrument panel is just not appealing and for the price I believe this bike needs to be something special and it feels and looks just OK to me. Just tested this XC right after spending a few long days and an RT. In the end it was a few simple things that swayed me over to the English GS. 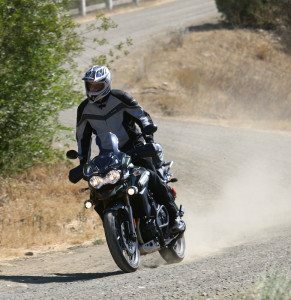 My size 46 feet did not fit on the brakes of the RT or the GS very well. They were both great bikes but both lacked that awesome note and pull of the triple cylinder engine that Triumph produces. It’s fun to drive slow and has great manners on the unpaved roads. 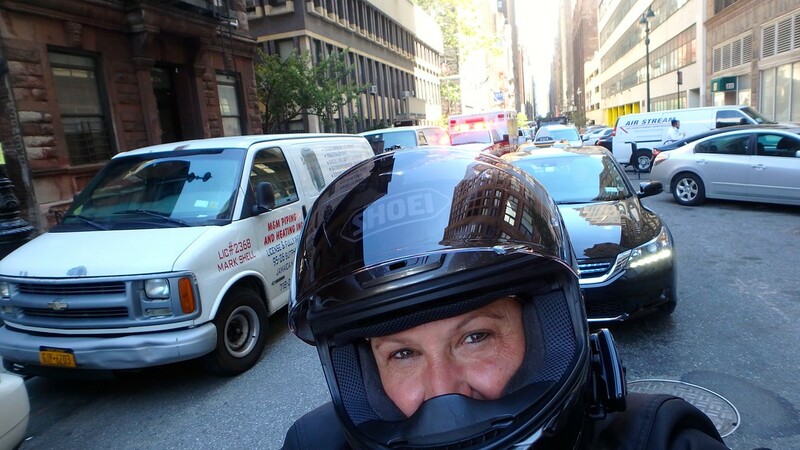 How many of us really are going to get very serious about going dirt on a 500 or 600 lb bike really of 1200cc? My self, I’m an off road poser. I see this XC as a lighter weight alternative to the RT or the Trophy (or Pan, FJR or Concours) I’m loving mine. The Matte Green paint job is very cool and right now different. I fitted mine with SW Motech upper crash bars and they do work really well in low speed falls. DAMHIK. I don’t know how valid the final drive “issue” is with the BMW’s but I was lurking on the BMW owners website and the final drive issue rears it’s ugly head there. Perhaps this issue is worked out. I know that the TEx has some issues as well like the TPS failures. A quick tip for any TEx owners. If you push the info button on the left control side and hold it in as well as the scroll button hold and then turn on the key you will show the error codes that are stored in the bike P0000 is nothing. I’m sure I would have been real happy with a GS but I’m loving the Explorer. 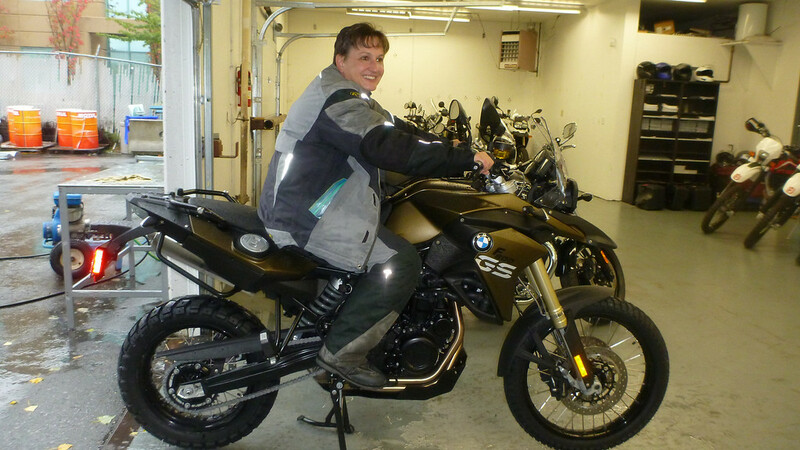 It’s as comfortable for me as a Goldwing and a lot lighter. BTW got over 60 mpg today in back road riding 50-60 mph.